Trimming overgrown avocado tree then graft? Re: Trimming overgrown avocado tree then graft? Sharwill seems to be a heavy producer. Too many fruits compared to the branch size. When is a good time to thin avocados? Alleged "Haas" branch turns out to be giving me round avocados, I guess it's a Reed after all? LOL no complaints! Fuerte (original branch) produced well this year. Congratulations on getting fruits from Few of your grafted varieties. Watch out for the Fuerte, it can get out of hand very fast. Reed and fuerte both growing fast, sigh. Oh correction, JB did produce one fruit. Congratulations, indeed. Seeing your result give me some hope, I been meaning to do something similar to my unknown avocado tree for a while now. Only problem is, I think tree is way too large now. You'll lose a few years of fruit but it should come back if you stump it and paint it with dilute latex paint to protect against sunburn. That's what commercial growers in SD did when we had drought weather. Stump their trees to reduce water and then return to normal production in 3 years. The only thing is the work it'll take you to cut that tree. That's great your grafts worked out and now fruiting. The past 2 years went fast. 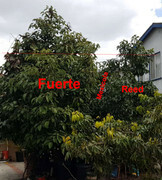 New varieties added to the tree after major trimming: hass (April) and suspected mexicola Grande (May). Fingers crossed they continue to grow well. This avocado tree is amazingly tolerant with me. Knock on wood. Fuerte branch received a major pruning earlier this year and understandably has much fewer fruits this season. I hope to always remove new shoots from that cut and not suffer major production losses in the future. Reed is crazily loaded: there are newer branches almost touching the ground. Jan Boyce also produces well considering its size. Sharwill, to my surprise, is either alternate bearing, or shadowed by nearby fuerte branches. Last year a smaller branch had quite few fruits. Just made some room for it. Queen: poor thing was nearly broken as a new graft, never attempted to flower and will be removed. Hass and mexicola grande: made room for these new grafts, hoping they can flower next season. Maybe there is hope I'll soon have year around avocado. Telling my parents when to pick what, is a different story!! Fuerte: I removed new branches from the top easily, just needed good eye sight! Because of limited production after heavy pruning, this year's fruits are very large. Jan Boyce: it was expected to ripen later than fuerte, but I think it's kind of ready in January and drops some fruits, and skin habitually cracks open (see photo). They will be eaten first. Sharwill: growing more after I cleared some room for it. Mexicola grande (suspected): fast vigorous grower! Reed: late season heavy producer, complements other varieties well. Fuerte: full bloom, earliest of my varieties. Mexicola: OMG it's flowering! I don't know if these thin branches are capable to support fruiting in one year's time yet, will monitor closely. Reed: no flower yet, late babies. Oh and I finally removed the struggling queen branch (graft got half broken by accident but continued to grow). In terms of vigor, for my tree Fuerte ~ Reed ~ Mexicola > Jan Boyce >> Sharwill. One year old Mexicola (suspected) shoots up for the sky and is already much taller than three year old Sharwill (which is not quite able to support itself upright). Took photos of the baby cados today. Reed only recently started blooming and I was surprised to see fruitlets. Glad to see Sharwill producing again. Fingers crossed mexicola will grow strong enough to handle those fruits. Another update on this multi-graft tree. I came home from an extended trip to find out I lost 70% of next year's avocados to extreme SoCal heatwave. Did not check very carefully, but fuerte appears to be the only one that still holds small fruits, baby Reed/JB/Sharwill either completely disappeared, or dried up and turned black. I don't know if it's each variety's specific heat-tolerance or the tree's strategic plan to save the bigger fruits as fuerte fruited somewhat earlier than others. Ditto, looks like the heat did a number on mango too from what I read on the forum. It's a super direct comparison actually. JB has most the mummy babies hanging on the tree. No trace at all for the reed and sharwill babies. Different varieties, different approaches. SoCal had a cold and rainy winter, even avocado hesitates to bloom. Due to 2018 summer heat, I had maybe 30% of the usual Fuerte and exactly one JB fruit surviving. Reed / Sharwill / Mexicola fruits all wiped out by the heat. In terms of relative tree size, roughly Fuerte 50%, Reed 30%, Mexicola 8%, JB 8%, Sharwill 4% -- does my math add up? Mexicola is quite vigorous, shame on you Sharwill!! !